Welcome to Inder Industries. Manufacturer and Exporter of Professional Tools and Machineries. The company was incorporated in 1988 at Jalandhar. We have spread our wings to Indian Subcontinent and Central America. Stringent quality control policies, Large Production Capacity and Flexible payment modes are the plus points of our organization. 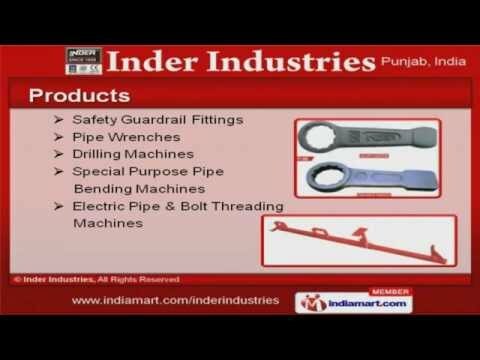 We offer a diverse range of Safety Guardrail Fittings, Pipe Wrenches and Special Purpose Pipe Bending Machines. Our Hydraulic Pipe Benders, Asada Products, Cutting and Crimping Tools are best in the industry amongst others. Pipe Reamers, Ring Spanners and Hand Pipe Benders offered by us are widely appreciated in the market. We have gained tremendous expertise in providing Hydraulic Pliers, Special Purpose Machines and Diamond Core Drills. We are engaged in offering supreme quality Pipe Circular Saws, Ornamental Casting Heading and Steel Files. Along with that we offer Castings, Measuring Tools and Pipe Stands that are one of the best in the market.